Environmental Protection Agency (EPA) officials did not intentionally skirt public record laws or encourage the use of private emails, the agency’s internal watchdog reported Monday, but one transparency advocate says investigators did not look hard enough. The EPA Inspector General (IG) released a report finding "no evidence that the EPA used, promoted or encouraged the use of private ‘non-governmental’ email accounts to circumvent records management." 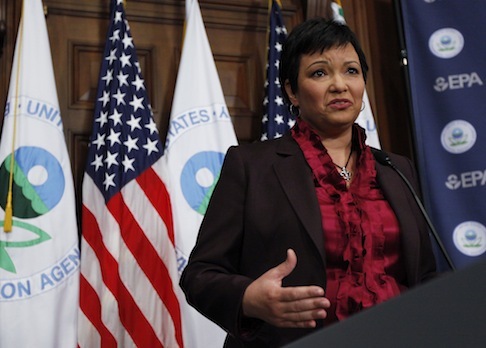 Republicans in Congress requested the IG investigation after it was revealed last year that former EPA administrator Lisa Jackson used a secondary email account under the alias "Richard Windsor." Subsequent Freedom of Information Act (FOIA) disclosures found several other EPA officials using private emails to conduct government business, a possible violations of federal record law. "EPA senior officials said they were aware of the agency records management policies and, based only on discussions with these senior officials, the [Office of the Inspector General] found no evidence that these individuals had used private email to circumvent federal recordkeeping responsibilities," the IG said. Chris Horner, a fellow at the conservative Competitive Enterprise Institute who first discovered Jackson’s secret account, said the IG was not looking hard enough. Horner has filed numerous FOIA requests and lawsuits to discover what he says is damning evidence of secretive correspondence between EPA officials and outside groups. "Relying on documentary evidence as opposed to the most conflicted parties imaginable, we obtained a different conclusion," Horner told the Free Beacon. "Just reviewing the ‘Richard Windsor’ emails we found two dozen senior EPA officials using private email accounts to correspond with a false identity, not apparently copying their own account as required in the rare instance they are forced to engage in that impermissible action. "We also found EPA hiding the identities of a handful of account holders, raising the prospect of more ‘Windsors’ and an issue we have brought to the court's attention," Horner said. "But, I mean, other than that, there's no evidence." The EPA has contended that secondary addresses are a common, longstanding practice among top administration officials whose public inboxes are flooded with millions of messages a year. "The previous EPA Administrator and the then Acting EPA Administrator who followed were issued two EPA email accounts," the report said. "One account was made available to the public to communicate with the EPA Administrator and the other was used to communicate internally with EPA personnel." "This was the common practice for previous Administrators," the IG continued. The report also revealed "the practice is widely used within the agency and is not limited to senior EPA officials." The report said such accounts "present risks to records management efforts if they are not searched to preserve federal records." However, Horner and other transparency watchdogs argued Jackson’s use of a false identity deviated from previous administrators’ practice of using their real names. former EPA chief Christine Todd Whitman used the alias "ToWhit." The EPA sent a memo to the National Archives and Records Administration in 2008 after discovering that some emails from the secondary accounts of previous administrators had been destroyed. The IG recommended that the agency "develop and implement oversight processes to update agency guidance on the use of private email accounts, train employees and contractors on records management responsibilities, strengthen relationships between federal records preservation and employee out processing, and deliver a system to create federal records from the new system." Testifying before the House Committee on Oversight and Government Reform earlier this month, Jackson said she never intentionally skirted records laws. "I have come to accept that there are those who will second-guess the judgments that I made or question the motives behind those judgments," Jackson said. "The principle reason I wanted to come here today is to make it perfectly clear that it was my practice to ensure that any official business conducted by me or through my email accounts was appropriately captured for record keeping purposes." When questioned about an email from her "Windsor" account asking a Siemens lobbyist to contact her through her home email, Jackson said they were old friends. "I believe personal friends should use personal emails," Jackson said to Rep. Trey Gowdy (R., S.C.). According to the IG, Jackson declined to be interviewed for the report. This entry was posted in Politics and tagged EPA, Inspector General, Lisa Jackson. Bookmark the permalink.